Black women visual artists rarely get their due. Lady Millard is a name you should know. 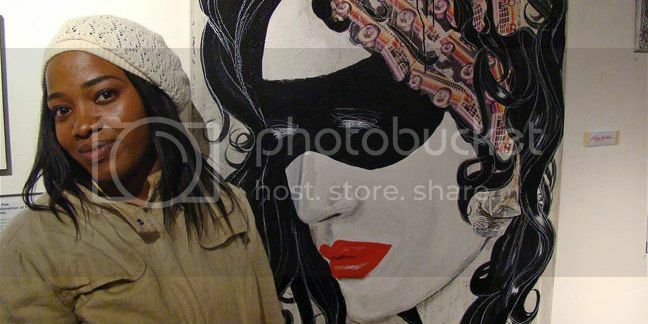 She's a New York based artist who primarily creates portraits. In this video, Lady Millard explains her work and inspirations. "This is Con Artist. It's a gallery, work space, collective space. We have a little mini store, a photo studio, gallery, and work space for a collective of about 25 members. My name is Lady. I go by Lady Millard, but Lady is what I tag on the street. I've been working as an artist for the last 10 to 12 years, and I paint mostly women and images of my dad. His name was Millard. I have three pieces here. They all have the same name with different dates. They're all called silent violence. Instead of being violent in action, you're being violent in non-action. Instead of protesting, instead of going in a direction that is against something you're protest is now internal, so that's the direction that I want to take the work. When I was in art school, I was one of the only black people period. My mother made sacrifices for me to be in art school. The financial cost is the number one reason why people of color aren't a part of the art scene. There's so many other people who write Lady, but I write it with two dots over the a. The meaning is change in German. Change is within everything. It is the ultimate force of nature. If you allow a society to fail, by giving a lack of resources the new generation will feed into the lack and develop something better."